Aloha! We flew from Kitchener to Honolulu with an overnight stop in Vancouver. We arrived into Honolulu late on the Thursday night, giving us all day Friday and part of Saturday to check out the island before we boarded the cruise. We picked up a rental car at the airport and made our way to the Aston Waikiki Sunset hotel. I would compare this hotel to the Embassy Suites in Niagara Falls. It is clean and spacious, there is a bedroom and a kitchen in every suite, but it is quite dated in it’s décor. We had a balcony overlooking the pool with a wonderful view of Diamond Head. In the morning, we headed out to Pearl Harbor for some history lessons and a very somber tour of the Arizona monument. 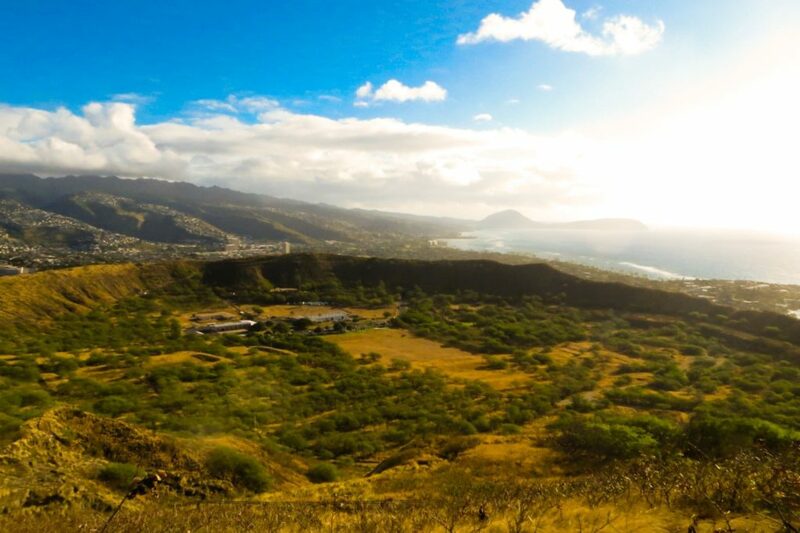 A must-see for any visit to Oahu for sure. Saturday morning we arose early and went to hike up Diamond Head. The views from the bunker at the top are spectacular! Before long, it was time to board our home for the next week; the Norwegian Cruise Line‘s Pride of America. The check-in process was pretty smooth. 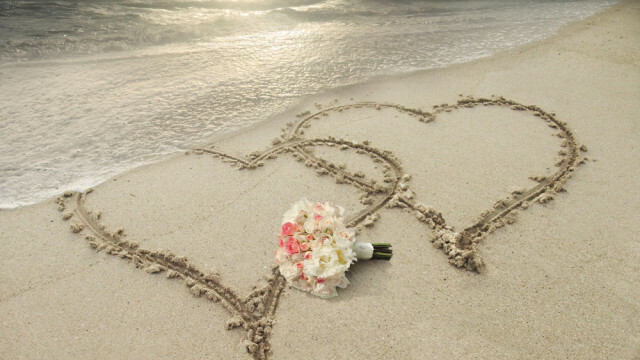 We all received Lei’s upon arrival at the cruise port – which I thought was a lovely touch! We had an inside stateroom on deck 4 that was very convenient for restaurants and the nightly shows. It was also very convenient for the gangway at each of the ports. The stateroom was only 132 sq ft, but we didn’t spend a whole lot of time in the cabin, so this didn’t really bother anyone. 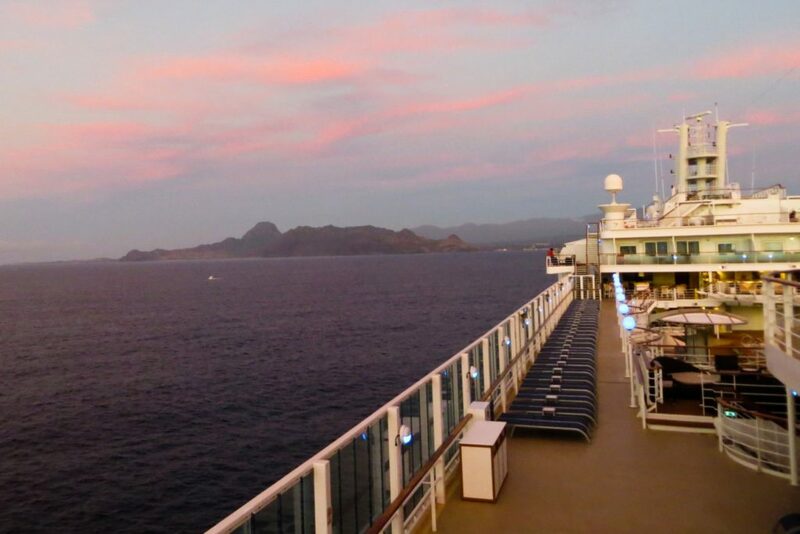 Most of our time on board was spent at the restaurants or on the sundecks or in the theatre. This ship is not incredibly big. It only holds around 2000 passengers and 900 crew. It never felt like we had to wait for anything. Getting on and off the ship was a breeze. We had our meals at either the buffet – which was really good, or at the “anytime dining” casual restaurants. My personal favourite was the Cadillac diner. With its ’50’s vibe and excellent service, it was definitely the top choice for us. This particular ship is not known for its quality entertainment compared to other ships in the Norwegian line-up. It is obvious that the highlight of the trip is the islands of Hawaii and all their beauty. The ship takes a back seat for sure. Having said this, though, we were never bored either. Due to large ocean swells, we had to have an unexpected sea day. We played mini-golf and shuffleboard, there was a library and a games room, plus some very nice shops. They played 1st run movies in the theatre, and the nightly shows were really good too. They had great comedians and magicians perform as well as some local Native Hawaiians to show off their traditions and skills. We were supposed to have 2 fairly full days in Maui, but due to the swells we had to leave early the second day. We were still able to see much of the island in the time we had. We went snorkelling and cliff diving at Kaanapali Beach. There were so many sea turtles, fish and coral! It was spectacular. We could see dolphins in the strait as well. It was too early in the season for whale watching – next time 😉 We went to Lahaina to see the Banyan tree that was planted on April 24, 1873! It is huge. My favourite tree in the entire world. There is a wonderful little Shave Ice shop across from the tree called Local Boys Shave Ice. I highly recommend it. This is easily my favourite treat! 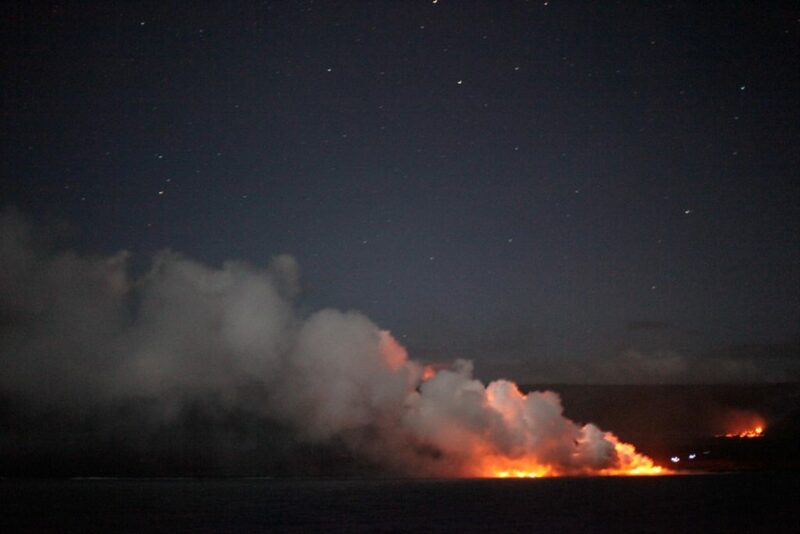 The large ocean swells kept us at sea for a day, so we weren’t able to port in Hilo on this trip, but we were able to cruise around the south side of the Big Island at night so we could see the lava flowing into the ocean. What a magnificent sight! We were able to tender into Kona, but we really wanted to see the volcano, so we rented a car at the hotel directly in front of the port and drove the 2 hours around the island to Hawai’i Volcanoes National Park. Well worth the drive. The scenery on route is stunning. 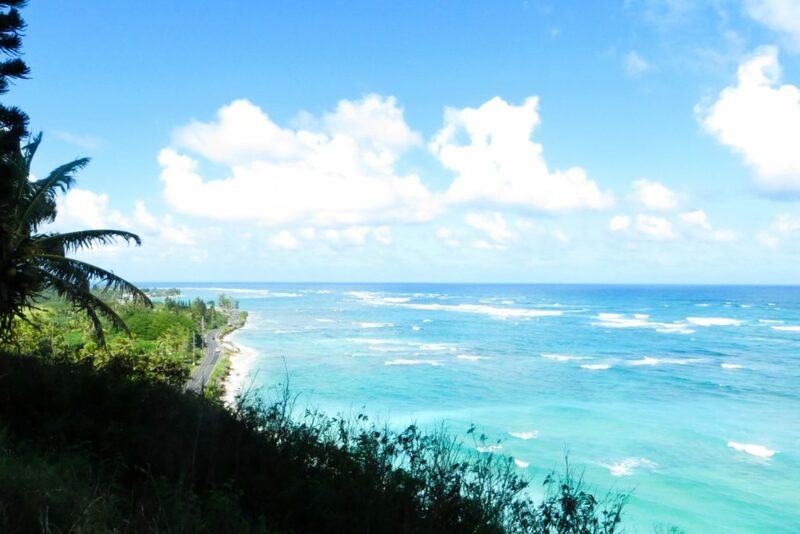 We stopped a few times along the way to check out the turtles and the black sand beaches. Having only the one day on the Big Island was definitely not enough in my opinion, but we made the best of it. Plus we knew we still had Kauai to come. Kauai is by far, my favourite island. And I say that knowing that all of the islands are spectacular. With 2 full days in port there, we toured the Waimea Canyon State Park. This is the Grand Canyon of the Pacific. “Stunning” doesn’t do it justice. After some more shave ice, we spent the afternoon snorkelling at Poipu Beach. For day 2, we went north. I can’t even put into words how spectacular the views are along the north shores. We stopped to eat some fresh coconut from a roadside stand on route. Once we boarded back onto the ship, we sailed past the Naapali Coast with a local guide giving a history lesson over the loudspeakers. 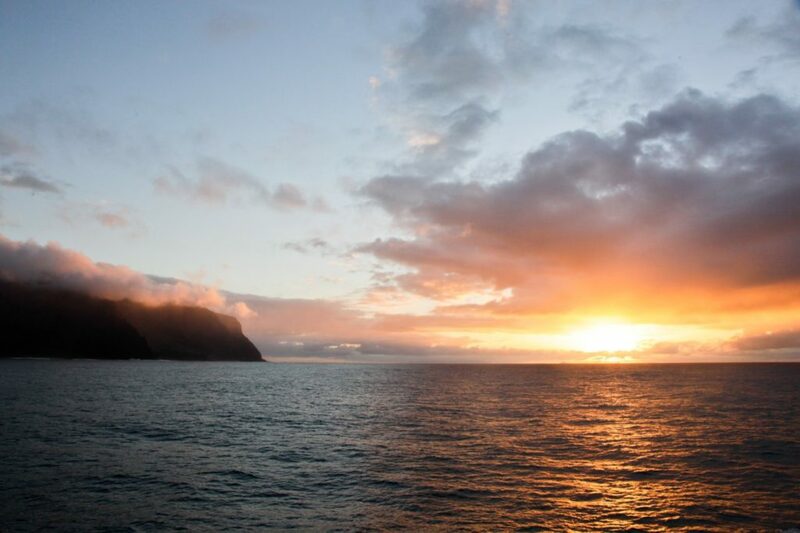 As the ship turned to make its way back to Oahu we were presented with the most stunning sunset. After the cruise we spent 2 more nights on Oahu before heading home, but this time we stayed at The Lotus at Diamond Head hotel. 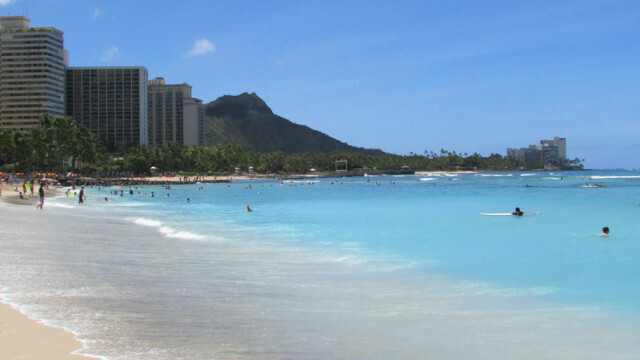 This hotel is right on the beach – literally 2 minutes from the main section of Waikiki. It is a boutique hotel with lovely carvings and candles in the lobby. There is yoga in the park across the street every morning. 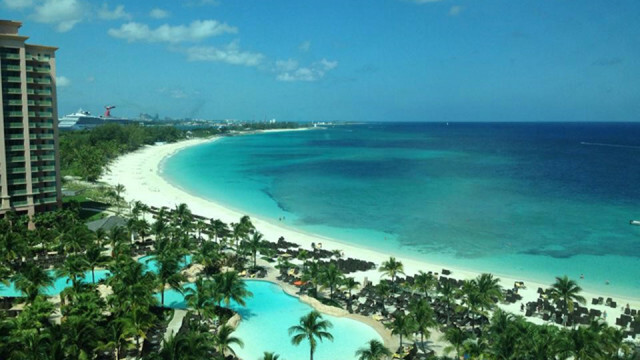 You can sign out beach towels, beach chairs and even cruiser bicycles to get around on! Valet even gives out complimentary cold bottles of water when you head out for the day. We took advantage of these two additional days by heading up to the North Shore to watch some surfers do their thing in the large swells. We hiked to Manoa Falls – about 2 hours round trip, depending on your speed, but stunning for sure! Our last day on Oahu, my eldest and my husband went ATVing at Kualoa Ranch. My youngest and I opted for the Secret Beach outing instead – hammocks, SUP, kayaking, volleyball – definitely more my speed. All in all a great day for all of us! We are already planning our next trip back. Once you go, it’s hard to go anywhere else. Mahalo.